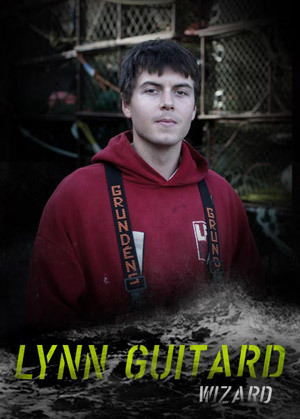 Lynn, the youngest crew member on the Wizard, was inspired by stories his fisherman father told him over the years about the king crab heyday in the 1970s. Lynn has been working the summer months out of Dutch Harbor with his uncle and father on halibut boats since he was 14 years old. He joined the Wizard for the 2007 king crab season in what was his first job during the winter months on-board a big boat in the Bering Sea. A family friend of Lenny Lekanoff, Lynn was well aware that Lenny took a gamble by recommending him for the job. As if being a relative greenhorn aboard a boat full of seasoned veterans in the Bering Sea weren't enough, Lynn had the added pressure of worrying about not letting his family and friend Lenny down. One of the few whipping posts to make it through the notorious Wizard greenhorn gauntlet, Lynn was upgraded to a full share deckhand during last year's King season. Lenny and the Wizard crew still don't plan to cut Lynn any slack. In Lenny's words, "If the kid's going to crack, I'm going to be the one to do it."